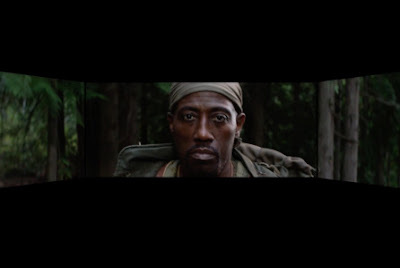 Wesley Snipes is my all-time favorite action star, so I've been happy ever since his return to the big screen in The Expendables 3. That said, we haven't actually seen a lot of him there. That makes today's release date announcement and first image from his new sci-fi film, The Recall, very good news. Directed by Mauro Borelli, the film stars Snipes as a mysterious hunter with knowledge of an alien invasion before it happens, claiming it has been prophesied for years. When the attack comes, he must lead a group of friends who were vacation at a remote cabin lake house. The film co-stars Jedidah Goodacre, R.J. Mitte, Laura Bilgeri, Niko Pepaj and Hannah Rose May. This will be more than your typical movie experience, as well. Snipes and the people at Barco Escape will release the film in a panoramic, multi-screen format on June 2nd, which will include 30-minutes of additional footage. On that day Barco will also make available a 12-minute virtual reality preview introducing The Recall's universe. A regular 2D version will then hit theaters and VOD on June 16th.